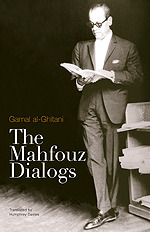 The Mahfouz Dialogs "Hard Cover"
The Mahfouz Dialogs records the memories, views, and jokes of Naguib Mahfouz on subjects ranging from politics to the relationship between his novels and his life, as delivered to intimate friends at a series of informal meetings stretching out over almost half a century. Mahfouz was a pivotal figure not only in world literature (through being awarded the Nobel prize for literature in 1988 he became the first writer in Arabic to win a mass audience), but also in his own society, where he vastly enhanced the image of the writer in the eyes of the public and encapsulated—as the victim of a savage attack on his life by an Islamist in 1994—the struggle between pluralism, tolerance, and secularism on the one hand and extremist Islam. Moderated by Gamal al-Ghitani, a writer of a younger generation who shared a common background with Mahfouz (al-Ghitani also grew up in medieval Cairo) and felt a vast personal empathy for the writer despite their sometimes different views, these exchanges throw new light on Mahfouz’s life, the creation of his novels, and literary Egypt in the second half of the twentieth century.